The unseen workers at any sailing event are often those who do the hardest and most crucial work: the boatbuilders. Oman Sail’s training programme includes this aspect of the sport of sailing, as well as the on-the-water, sailing. Head Boatbuilder with Oman Sail is Phil Rivett, 33, who hails from Australia. Phil is very friendly and approachable, and extremely good at explaining how to do things and then leaving people to try the task for themselves and learn from any mistakes they make, and then patiently going over any issues, all of which provides the best possible learning environment. One example that I saw was Phil explaining about when stitching is and isn’t needed when splicing ropes and then leaving the Omani trainee boatbuilders to go ahead and do it alone and join the ropes. Phil Rivett’s immense experience with boatbuilding includes the around-the-world campaigns of Ellen MacArthur and Emma Richards, plus the Volvo Ocean Race ABN Amro and Ericsson yachts, the Swedish America’s Cup Victory challenger and Al Busaidi’s circumnavigation; the first recorded by an Omani sailor. two Oman Sail trainee boatbuilders, Mohammed Al Shikely (affectionatly known as TechMo within the team) and Sulaiman Al Manji, with occasional visits from other Omani trainees. In addition, specialists were brought in for specific tasks, such as ultrasounding the MOD70, or for changing the sponsorship signage. Some of this work is also done by the boatbuilding team. Although it may sound easy, putting on sponsorship stickers, with the need to line everything up, ensure that there are no air bubbles, and that there is solid adherence, is actually a very tricky task. Prior to coming to Oman Sail, Mohammed studied in college for a year and learnt English. He was doing a technology course. When the chance to work with Oman Sail came up, he left college immediately! Asked what he would have done if the chance to work with Oman Sail had not come along, Mohammed replied “Business – working for the economy”; very different – working with figures and talking to people, whereas the boat work is technology-based and practical. Mohammed’s favourite boat is the Extreme 40, because of the intense action in the racing in this class. “It is exciting! You know why? Because you do a small race in the Extreme 40 and maybe crash the boat, or anything, so that’s exciting for me. I like it.” Crashing the boat makes for more glassfibre work for the boatbuilders! In 2013 there were three Omani trainee boatbuilders who travelled and another three or four based in Oman. 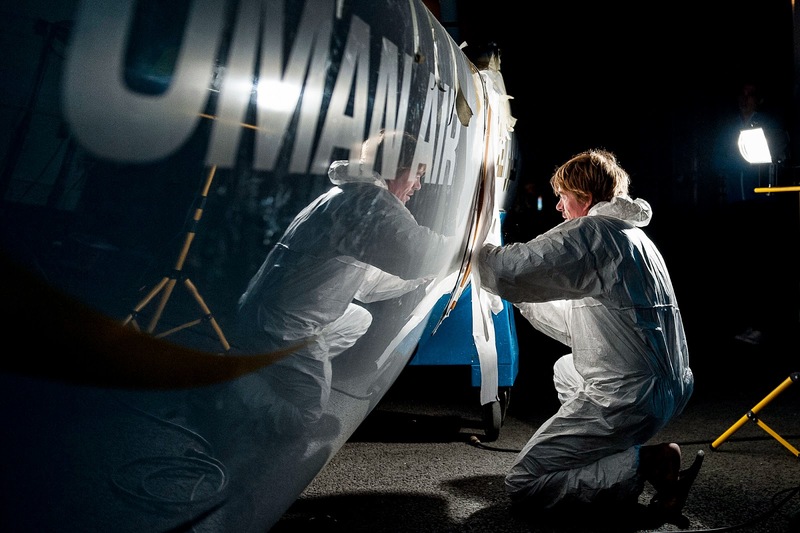 “I went back to Oman [in 2013] for an Extreme 40 refit,” said Phil. “We had to make moulds, so it was interesting to show the trainees a different side to boatbuilding, and not just do things over night as we fix the boats in the fleet racing [for the Extreme Sailing Series]. Also, the boys are learning painting skills, so just developing all sides. We will send the boys to technical college shortly to start learning the theory and that helps them as well. “There has been a lot of on the job training. We have some pretty amazing boats. We’ve got a couple of Extreme 40s, and the MOD which is the flagship of the fleet. They are all different boats, so a lot of the skill set is around the boats. There are a lot of different things to do on an MOD70,” says Phil. “There are cleans and check-ups with the Extreme 40s too [cleaning the boat thoroughly is used as a means to check for items that need to be repaired], so there are so many different things, the winch system on the boat, the hydraulic system, ropes, glassfibre work, and the structure, so it’s a bit of everything on a bigger vessel. Just making sure they do the things once, not twice.” At present the Omani trainee boatbuilders are doing things on a boat on an as-needed basis. The emphasis is very much on only doing things once, and doing them well, rather than having to repeat the work. While Oman Sail will always need boatbuilders, the idea is to train up the Omanis so that they can work in boatbuilding teams all over the world. “One of our boys back in Oman got requested for one of the teams [Artemis] on the RC44 circuit. That is a great achievement, for him and myself. Hilal al Zadjali had been with the company for three years. He started working on the structure and then we moved him to the technical side of things. He showed initiative and we wanted to give him a bigger skill set and help him, so it progressed from there. The Omanis are clearly greatly enjoying their work learning boatbuilding, and the exemplary Oman Sail training programme is developing skills in Omanis throughout the spectrum of the sailing world, which will enable the industry to build up in Oman; a firm base for the international development of Oman and Omanis through the sport of sailing, while broadening involvement in sailing throughout the country and the Arabian peninsular.